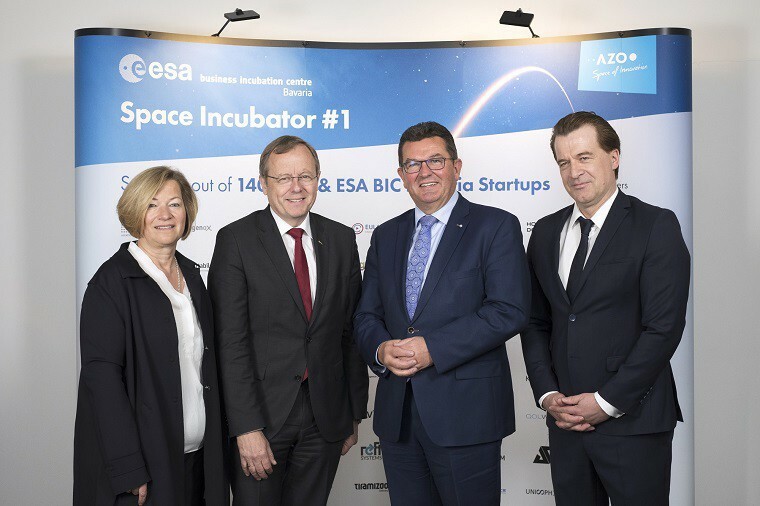 Breaking news for the ESA Business Incubation Centre (BIC) Bavaria: The European Space Agency (ESA) is extending its successful collaboration with AZO Anwendungszentrum GmbH Oberpfaffenhofen for its ESA BIC Bavaria by an additional four years! Put into figures, this means EUR 1.5 million are secured for 60 new high-tech startups. It is ESA BIC Bavaria’s mission to support 200 startups by 2021. The signing of the contract took place today in the Bavarian space hub Oberpfaffenhofen. ESA Director General Prof Johann-Dietrich Wörner, the Bavarian Minister of Economic Affairs Franz Josef Pschierer, and Dr Walther Pelzer, Member of the Executive Board at DLR Space Administration belonged to today’s special guests along with various strong partners, space attachés, ESA BIC Bavaria startups and media representatives.